More and more smartphone vendors are jumping on the rugged device bandwagon, which isn’t surprising as competition in this arena is still sparse, while profit margins are healthy given the higher retail prices these handsets usually carry. Online Chinese retailer, Gearbest, sent us the review sample and sells the Doogee S60 ruggedized smartphone for just over £220 (around $290) at the time of writing. Note that, while this price includes delivery, it is exclusive of any taxes that may be levied by HMRC or the courier companies on behalf of the vendor. Want to buy tech from online Chinese retailers? Read this first. Samsung with its Galaxy Active range is probably the most well-known ruggedized vendor out there but there are several other players – Cat, AGM, Homtom, Ulefone, Blackview, Nomu and Doogee to name some – that are scrambling to get a bigger piece of the ruggedized pie. The latter has just released a new flagship model called the S60 – not to be confused with the Cat S60, the EL S60 or the Lenovo S60 – which couldn’t have been more stereotypically designed. The marketing material and pictures that accompanied its launch clearly point to the return of the classic ‘man’s phone’. The S60 is available in black, gold or silver, and the manufacturer even came up with special ‘Game of Thrones Edition’ versions (essentially having quotes from the popular TV series written on the back). Like many of its competitors, the (Spanish) designers opted for the classic octagonal chassis (four slanted corners and four long sides) usually associated with ruggedized smartphones. The S60 is one of the heaviest smartphones we’ve tested at 285g, which is almost twice the weight of the Apple iPhone 8. Its dimensions – 163 x 83 x 17mm – are also well above-average, although bear in mind that you are unlikely to put this handset in a case or hard shell. Unless you have big pockets, it’s unlikely that you will carry this device around on you. 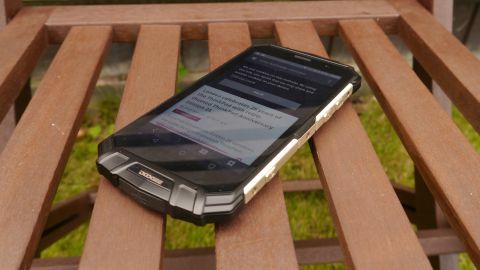 It’s clear enough that finding the right balance between portability and ruggedness is an ongoing process, and Doogee seems to focus more on the latter using a combination of metal (aerospace-grade aluminum) and high density polycarbonate plastic rather than rubber to increase this device’s resistance to shocks and bumps, earning it a well-deserved IP68 certification. The screen, a 5.2-inch Full HD IPS display, is covered by a Corning Gorilla Glass 5 overlay which should protect it from scratches. There seems to be an oleophobic coating as well, as the screen is noticeably less prone to fingerprint smudges compared to competitors. The fingerprint reader is located at the back alongside the camera sensor, the speaker and dual LED. The SIM and microSD slots are positioned underneath a metal cover that can only be accessed when you take out two screws (a screwdriver is provided). The microUSB port is located at the bottom of the device while the audio socket is at the top. Both are covered by rubber flaps which can be a bit of a pain to open and close. There are three buttons on each side: volume up and down, along with an SOS button on the left; PTT (push to talk), power and a dedicated camera button on the right. Doogee didn’t skimp on the components for the S60 – this flagship smartphone got best-of-breed hardware innards (well, almost). It packs one of the most powerful SoCs available outside of Qualcomm’s stable – the Mediatek Helio P25 – backed with 6GB of premium LPDDR4 memory and 64GB of Samsung-sourced flash memory for storage. The camera sensors are Samsung and Sony-sourced as well; the rear 21-megapixel model can only record in full HD despite the Mediatek P25 CPU supporting 4K. The S60 is unique amongst rugged smartphones as it bundles both NFC and wireless charging, potentially allowing you to bypass the on-board physical ports completely. Note that it doesn’t come with a wireless charger, though. When it comes to connectivity, the chipset (and therefore the phone) supports 802.11ac Wi-Fi, Cat-6 LTE, and Bluetooth 4.1 as well as all the major satellite navigation systems. A 24W (12v2A) power supply unit feeds the bigger-than-average 5580mAh battery. The S60 is a larger-than-life phone, so it’s a bit of a handful to handle compared to the typical much lighter smartphones out there. There’s nothing intrinsically wrong with the S60’s size, but this is just something to bear in mind. The IPS display boasts great color reproduction which should cater for most tastes and it is brilliant even outside where the S60 is expected to be used most often. The smartphone delivered superb performance levels in our benchmarking, and is suitably equipped to tackle most recent games on the market. There was no noticeable lagging when putting the S60 through its paces. We couldn’t apply the latest firmware update for some odd reason. The S60 runs on Android 7.0 as expected and doesn’t have a lot of extra bundled apps. One of the included applications is Zello, which is a walkie-talkie/push-to-talk solution that works particularly well for teams. There’s also DGXender, which is a nifty solution for transferring files between compatible devices. The most compelling app (or app bundle rather) is the aptly named Toolbox, consisting of tools that use the host of sensors on the S60 to deliver the sort of functionality an outdoor professional (working in the field or on a construction site) might expect. There’s a sound level meter, a compass, bubble level, heartrate monitor, pedometer, barometer, protractor and a few more: all free to use and without restrictions. The Doogee S60 is a worthy rival to the likes of the AGM X1, the Blackview BV8000 Pro and the Ulefone Armor 2. Unique features like wireless charging and a sound level meter push it higher up the list of the best rugged smartphones, and its affordable price tag make this handset an almost must-buy. Doogee has ticked all the important boxes, but that said we’d like to see 4K recording, a less ostentatious look (like the AGM X1) and a better implementation of the firmware update mechanism. Is the S60 the right rugged phone for you? That will depend on whether you can live with the industrial, brash design, and the fact that the handset carries a name that will lend itself well to mockery.